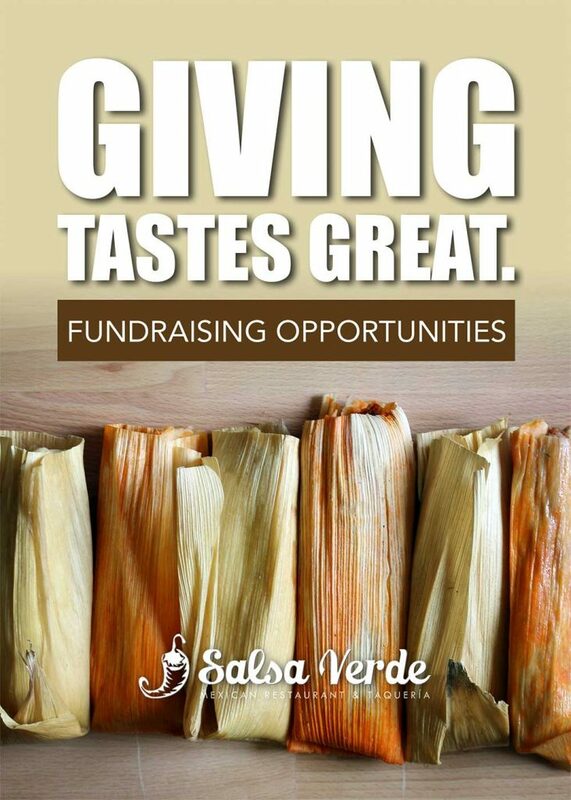 Since 2012, Salsa Verde has been dedicated to the community around us and we look forward to continuing to build a strong fundraising partnership. Let us help your non-profit organization raise the funds needed to continue its success! 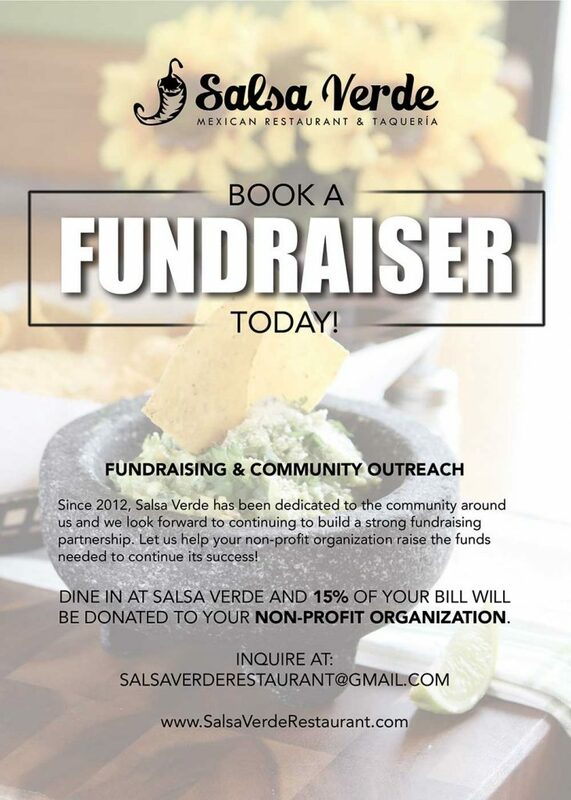 DINE IN AT SALSA VERDE AND 15% OF YOUR BILL WILL BE DONATED TO YOUR NON-PROFIT ORGANIZATION. We are ready to raise funds! Are you? 1- Let’s pick a date! Our fundraising events are schedule on a first come-first serve basis. Some events are scheduled months in advance while others are organized with only a few days of anticipation. Mondays, Wednesdays and Thursdays are the only days in which we host fundraisers. Once we confirm the date, we are ready to take the next steps. 2- Let’s create a catchy flyer! This will be the attention getter, let’s get creative! We encourage you to design a colorful ad which you will be distributing through social media, email, text and even printed form. Lacking graphic design skills? We’d love to help. With enough notice, our marketing team can design the ad for you. 3- Let’s spread the word! Remember, the success of your fundraiser will be proportional to the efforts we put into reaching out to people. We’ve encountered over the years that those who spread the message through different platforms are the ones who raise the most. Repetition is key. Social media is a great tool at no cost but it’s important to reach your audience in other ways too. Email, text messages and hand-out flyers are very effective ways you could use too. 4- Let’s raise some money! Our team will be excited and ready to host the event. Encourage your audience to present the flyer at the register in printed or digital form. If possible, drop off extra printed flyers for us to distribute and to attach to all arriving transactions. This will help us ensure your organization receives proper credit from all purchases. We can write the check to your organization as early as the next day, but please allow 1 to 3 business days for our team to finalize the count. Book now by emailing salsaverderestaurant@gmail.com or use our contact form to get started!